The fine folks at The Rumpus were good enough to publish a few of my comics. 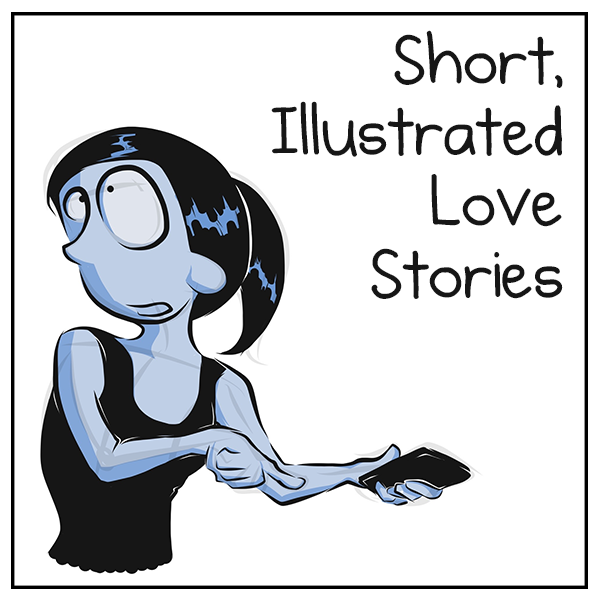 The comics are a set of three, collectively titled ‘Short, Illustrated Love Stories’. I hope you read them, and enjoy them. And if you do enjoy them (and even if you do not), please consider donating a bit to The Rumpus. Small arts organizations are mostly labors of love for the folks who run them, and they don't expect to be paid. That said, money never hurts them! None of this will go to me. It's all for them. You can donate here. In prepping to publicize this comic to my vast following of tens of people, I played around with different thumbnail images for the comics. I ended up with the one above, but below are a few alternate ideas. The penguin says it all. I probably won't win, but it's still lovely, and a first for me. If you're curious about 'Doll Love', you can read my initial post about it from back when it was published, or just buy it—it's only $8 and I enjoyed the other stories in the issue. When you order, remember to specify the Summer 2015 issue / volume 36.1. Or just get a subscription. Also, Pushcart's 2016 collection came out a few weeks ago, no doubt full of great reads. Both this and Jabberwock Review are great stocking stuffers, especially for all your cubic, book-shaped stockings. New Writing! Accept / Decline in Carve Magazine. Carve Magazine, a beautiful Texan literary journal, is running a feature about me in their latest issue! The feature is called "Accept/Decline" and it appears regularly in their Premium print editions. Each edition, they focus on a story they liked but had to reject, which then went on to get published elsewhere. They highlight the differences, if any, between the draft they read and the final published piece, feature comments from both the rejecting and accepting editing staffs, and run an essay by the story's author about getting the story published. The essay tells the story of the story. In my case, the story is 'Doll Love', which ran recently in issue 36.1 (Summer 2015) of Jabberwock Review. 'Doll Love' not online but you can buy it, or read a little about it in an older blog post. And my essay in Carve is also print-only, but their fiction is online and free, and the print edition is measly $12 bucks and comes in the mail and has that glorious fresh-from-the-printer new-magazine smell. Side note—my essay features a photo of me, which I've always liked and which has gotten a wide variety of reactions, from "great photo!" to "you kind of look like a farmer in this" to "were you constipated when this was taken? You look like you were constipated." If you ever see this photo and wonder who took it, wonder no more: Joe Turic, of Less Gear More Photos. Joe always insists on taking photos of me, whenever we're hanging out. I mean, I can't get him to stop. He's so insistent that I usually pre-empt him and tell him to just take the photos already. "Just take the damn photos already Joe! I know you want to! Go ahead! Do it now. No we can't go eat or hang out with our girlfriends or go do whatever it is we planned on doing. Make sure to get some candids while you're at it!" To the casual observer, it might look like I'm harassing Joe into taking my pictures, but be not fooled, dear readers. I swear I'm not a terrible uncle in real life. Today, two quickie comics, both punny. I'd say I'm sorry for inflicting puns on you but I'm not, okay? I'm just not. Click on the images or the links to see the full comics.